The phrases “beautiful disaster” and “bad romance” but NOT the well-known novels that use those phrases for their titles. Five different Emilie Autumn songs, “Did You Imagine” by Lumidee, and “I Want My Tears Back” by Nightwish. These are just a few of the things that Winner Take All is associated with in my head because all of those things fit the book’s events at one point or another. Winner Take All is a hate-to-love novel that happens to go through the cycle a number of times. Hate to love to hate to love to hate to looooove… Six-foot-tall explosion of intensity Nell (talls girls in YA, whoo!) and garbage golden boy Jackson are obsessed with each other as they volley for the number-one spot in their grade and I almost obsessively read their book in the span of a few days. At the same time Nell would like to show him what’s what, she’d also like to make out with him–and Jackson feels the exact same way. Nell hit me in the heart particularly hard as a character, especially because she had a panic attack over a .001 difference in GPA that puts Jackson in the number-one spot. I too was so obsessed with keeping my grades high in school, particularly in my senior year of high school when I wanted to achieve an all-As school year for the very first time. When a print photography project threatened to ruin my grade, I suffered my first-ever panic attack in the middle of a crowded school hallway. My photography teacher witnessed it and kindly waived the print photography project for me. So yeah, I get where Nell is coming from to a degree. Even then, Nell’s mom (also her prep school’s headmistress) pushes her much harder to succeed than either of my parents pushed me. And to be frank, they didn’t need to push me much at all because I did well with little effort. Meanwhile, Jackson has a few secrets while he and Nell are dancing around with one another. He’s got a garbage, serial-cheating dad and his mom is wrecked due to the aforementioned serial cheater, but he’s got some humanity hidden waaaaaaay deep down in there. At times, you can’t tell who’s more serious about their relationship: Nell or Jackson. The strength of Winner Take All comes down to the lit-match-meets-gasoline dynamic these two share and the many, many twists in their mutual story. That’s not to diss the strong subplot wherein Nell’s best friend Lia is dating a guy whose mom is currently prosecuting Lia’s dad for corruption. Lia is a particularly welcome presence in the novel because she’s usually the one calling Nell on any bull. When Nell reaches her most obsessive, it’s Lia who sets her straight by reminding her that Nell Becker is not the center of the solar system. She’s just as much of a mess as everyone else in the novel, but Lia is my favorite mess. My one bone to pick is with that ending. For a novel that’s outright described to be about “obsessive love,” it ends on a note that feels anything but satisfying. I felt a shot of dread instead because good GOD these two need to exist a significantly away from one another. At least a full state apart. It’s true: Laurie Devore’s novels are the readalikes for Courtney Summers fans. 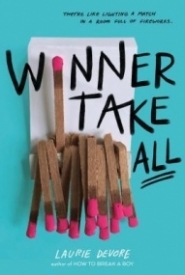 Winner Take All is even a step up from How to Break a Boy and I’m excited to read the next book that comes from Devore’s hands. It’ll fulfill your desire for imperfect, messy leading ladies in YA!